In large bowl, make cake batter as directed on box. Divide batter evenly among muffin cups, filling each two-thirds full. Bake 12 to 17 minutes or until toothpick inserted in center comes out clean. Cool 10 minutes; remove cupcakes from pans to cooling racks with cooking parchment paper underneath racks. Cool completely, about 15 minutes. When cupcakes are fully cooled, use fork or wooden skewer to poke holes in tops of cupcakes, cleaning off end with paper towel as needed. In 2-quart saucepan, heat 1 cup water to boiling over high heat. Remove from heat; stir in gelatin and 2/3 cup champagne until gelatin dissolves. Use large spoon to spoon mixture evenly over cupcakes. Refrigerate cupcakes while making frosting. In medium bowl, beat softened butter with electric mixer on medium speed until smooth. Add powdered sugar, 1/4 cup champagne and vanilla, beating until smooth. Frost cupcakes. 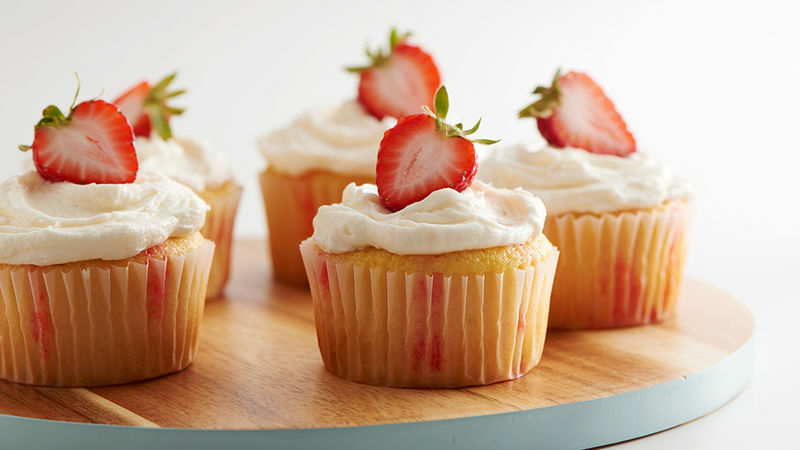 Garnish each cupcake with halved strawberry. For less mess, use a squeeze bottle to pour gelatin mixture over cupcakes. Store cupcakes covered in refrigerator up to 2 days.